I wanted to share this gorgeous winter wedding. Chelsey and Brendan were as chill as the day. They lucked out with no rain and were able to take these wonderful shots by Clint Bargen Photography. Marsala is one of the prettiest colour combinations and garden style shows it so well. Wishing Chelsey & Brendan an amazing life together. Well, it’s arrived. Pantone, the arbiter of all that is colour, announced that the official “It” colour of 2015 is Marsala, a soft brownish red named after the sweet Italian wine. A radical departure from Pantone’s more recent colour picks (2013 was Emerald, and 2014 was Radiant Orchid), Marsala is a softer, earthier tone that will be universally appealing, especially to brides, who may find its hue more flattering on them than hot purple. Already popping up in fashion shows and interior design, we’re starting to see it more in weddings as well. Not that we’re surprised – Marsala partners beautifully with brightly coloured summer tones such as pink, yellow and orange, grounding them and making them more sophisticated, but can be the star of the show on its own with white or ivory. We especially love it set off by interesting greens like eucalyptus and dusty millar for a modern flair. 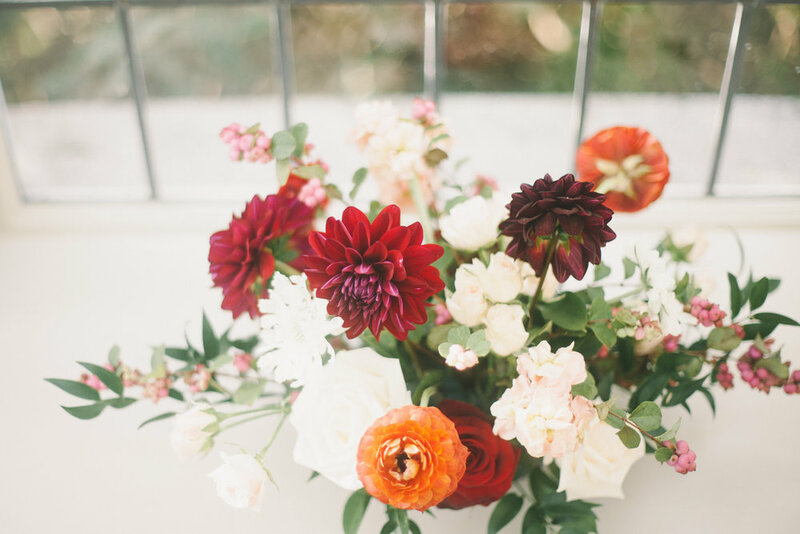 Some classic blooms that come in Marsala hues are gerberas, dahlias, peonies and calla lilies, and for those who want to take a more exotic , edgier approach there is kangaroo paw and orchids. It even comes in succulents! Oh, all right, not really, but they’re so cool that we wanted to include them anyway. All of these flowers are gorgeous, but if you’re keeping an eye on the bottom line then stick to gerberas, dahlias and kangaroo paw. They’re less expensive, but will still give you the look you’re going for.